The kidney’s role is to filter blood and remove excess ions/water to produce urine. The functional unit of the kidney is the nephron. 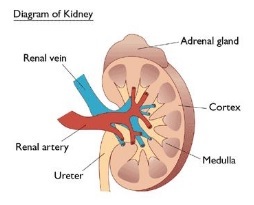 The nephrons spread across the cortex and medulla of the kidney. Blood enters the organ via the renal artery and exits via the renal vein. In between, it passes through tiny capillaries that surround the continuous tube constituting the nephron. What is left in the capillary? 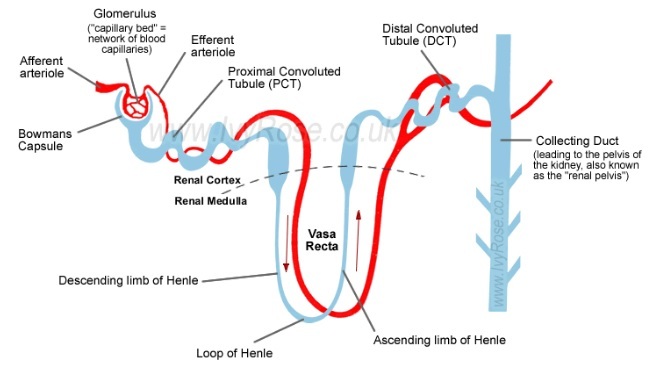 You’re sure to impress examiners if you are able to clearly recall the different processes that happen in the descending and ascending limbs of the Loop of Henle. ADH is a really important hormone involved in regulation of blood’s water potential. Make sure you remember what triggers its release and what its overall effect is.